This is an elementary book on stress and strain theory for geologists. 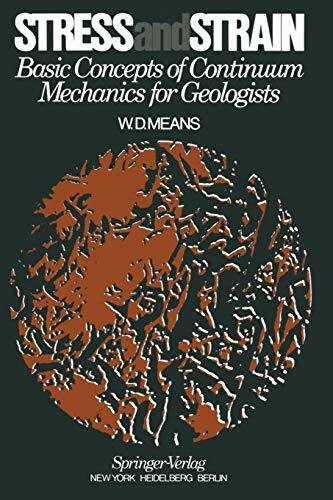 It is written in the belief that a sound introduction to the mechanics of continu­ ous bodies is essential for students of structural geology and tectonics, just as a sound introduction to physical chemistry is necessary for students of petrology. This view is shared by most specialists in structural geology, but it is not yet reflected in typical geology curricula. Undergraduates are still traditionally given just a few lectures on mechanical fundamentals, and there is rarely any systematic lecturing on this subject at the graduate level. The result is that many students interested in structure and tectonics finish their formal train­ ing without being able to understand or contribute to modem literature on rocks as mechanical systems. The long-term remedy for this is to introduce courses in continuum mechanics and material behavior as routine parts of the undergraduate curriculum. These subjects are difficult, but no more so than optical mineralogy or thermo­ dynamics or other rigorous subjects customarily studied by undergraduates. The short-term remedy is to provide books suitable for independ­ ent study by those students and working geologists alike who wish to improve their understanding of mechanical topics relevant to geology. This book is intended to meet the short-term need with respect to stress and strain, two elementary yet challenging concepts of continuum mechanics.